Put gluten free bread crumbs into a large bowl with ground beef. Add remainder of ingredients. (If your family has trouble with texture, you can pulse the veggies in a food processor until smoother before adding.) Using hands mix until vegies and spices are evenly incorporated. Divide mix into 3 heavy duty zip sealed freezer bags. Label with contents, date and baking instructions. Baking instructions: Preheat oven to 375. Shape loaf and put into a loaf pan. Place in the oven with a baking pan set on the rack below to catch drippings. Cook until a meat thermometer inserted in the center reads 160°, about 90 minutes. If top gets too dark, cover with foil, and continue baking. For a more evenly crisped crust: Cover a cooling rack with foil and place on a rimmed baking sheet. Poke holes in the foil. Shape meat mixture into a loaf and place on foil. Bake as directed. To bake with glaze: Mix together ⅓ cup gluten free ketchup, 3 tablespoons packed brown sugar and 2 teaspoons mustard. After baking for 45 minutes, brush loaf with half of mixture. Bake 15 minutes more, Brush remaining mixture on meatloaf. 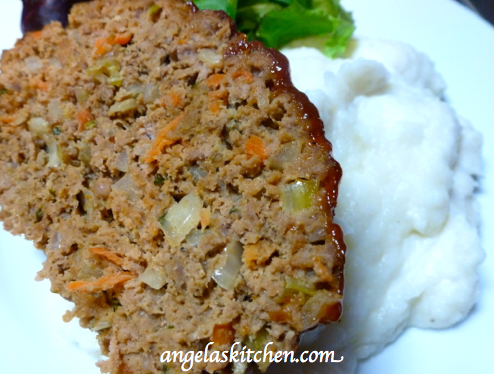 Bake another 15 to 30 minutes until meatloaf is baked through. Variations: Pizza Meatloaf ~ Replace ketchup with pizza sauce. Do not add dry mustard. Add a finely minced green pepper to the veggies. Add 1 tablespoon dried oregano and 2 tablespoons dried basil. 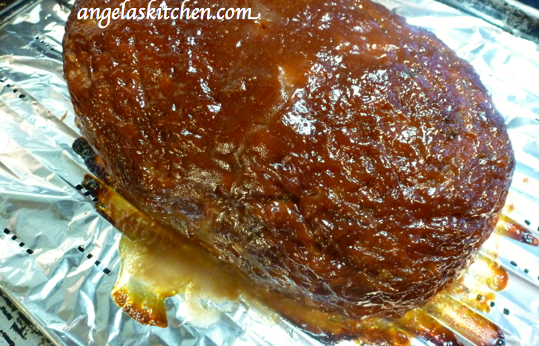 For a nicer crust on the meatloaf, bake on a foil covered cooking rack placed on a rimmed baking sheet. Pierce the foil to allow any grease to drain away. I generally make a triple batch of meatballs as you see below, but if you need different batch amounts, here is a printable recipe card with multiple batch amounts for freezer cooking with slightly differing amounts for better division and multiplying. Arrange about half the meatball on two 10-by-15-inch jelly roll pans. Bake in preheated oven until meat is browned, with no trace of pink and juices run clear, 10 to 13 minutes. Cook the remainder of the meatballs the same way. Drain, let cool to room temperature, divide into 3 heavy duty freezer bags (You will get 6-8 servings per freezer bag), removing as much air as possible and seal. Be sure to label the bag before putting in the freezer with contents of the bag and the date! I precook hamburger with diced onions and garlic. I generally will also add diced green pepper. After the meat is no longer pink, I drain the fat, cool in the refrigerator, then package into 4 cup heavy duty freezer zip closed bags. Be sure to label with the contents of the bag and the date you are packaging your bags. In a couple of weeks you will not remember what is in the bags and everything frozen will look the same! 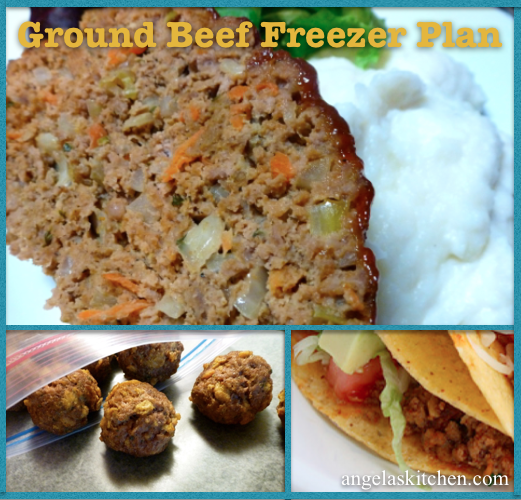 You can use this for anything that calls for cooked ground meat: chili, spaggetti sauce, stroganoff, tacos, etc. 31 onions?? Is that right, or should it be 3? That is A LOT of onion!Great plan though. You are one effecient mama! Woa…too many. I must have blinked. Sorry about that. It’s fixed now! We so missed you today. Is everything okay? Don’t worry Cari!I’ll make sure that she gets a “spa” treatment this week!